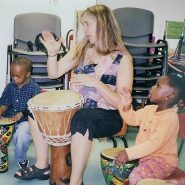 After a performance, Caryn Lin works with smaller groups of students to demonstrate looping, sound effects, and other techniques she shares throughout her assembly program to give students a more in-depth, hands-on experience. 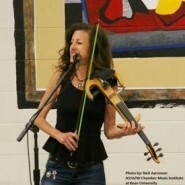 Caryn can work with string students or band students, or conduct a general music workshop. Note: Workshops must be in the same room as the assembly program. The workshops specifically for band students were given in a positive and relaxed atmosphere, enabling all students of mine, regardless of performance level, to feel comfortable and at ease that virtually all my band students wanted to and did participate. 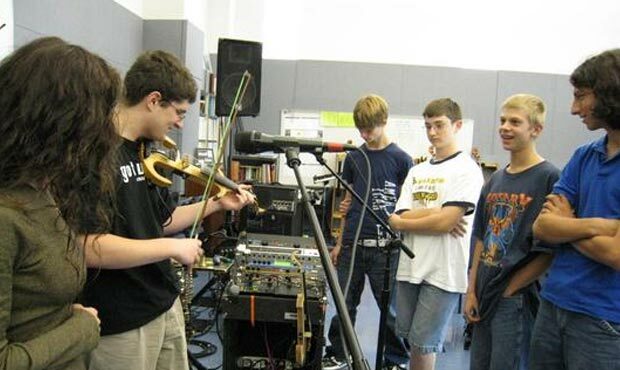 My students came away with a new appreciation of the use of technology in the preparing and making of live music. They were very excited, and talked about it for days afterward. Thanks much! !